The U.S. Mint’s weekly sales report is out and the most notable changes are the result of a couple of negative corrections for high profile releases. 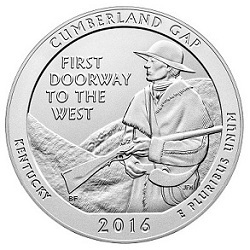 The 2016 Cumberland Gap 5 oz. Silver Uncirculated Coin saw a downward adjustment of 1,251 coins, decreasing its total by 7.5% to 15,339 units sold. This puts the Cumberland Gap issue at 2,198 fewer sales than Shawnee 5 oz. Uncirculated coin, released on February 25. Both issues have mintage limits listed at 30,000 pieces, though coins in this series have rarely approached that quantity. The 2016 Mercury Dime Centennial Gold Coin received a 36-coin negative correction to arrive at 116,139 units sold. This is by far the smallest adjustment made to the item’s sales total since it was released on April 21. As the Mint has stated the item will remain in “Unavailable” status until all returns and cancellations are sorted out, and smaller weekly corrections may mean collectors can begin to look forward to the release of the remaining inventory. The coin’s mintage limit is listed as 125,000 pieces. The 2015 American $1 Coin and Currency Set is now listed as “Unavailable” on the Mint’s Web site. As of Sunday evening, sales of the item hit 88,363 of a possible 90,000 units. The three highest-selling products last week were the 2016 U.S. Mint Proof Set with 10,858 sales, the 2016 U.S. Mint Uncirculated Set with 7,393 sales, and the 2016 U.S. Mint Silver Proof Set with 6,167 sales. The following statistics show total sales for the listed items through June 5, 2016. The first numerical column includes information from the Mint’s May 30 report, the second column displays this week’s updated numbers, and the third column tallies the increase in sales over the last week. Items new to the report are listed in bold. For more information on any of these products, please visit the U.S. Mint’s online product catalog.